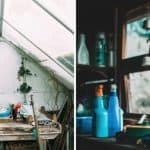 What is the best type of garden shed to buy? Whether you grow your own veg or venture into the garden just to mow the lawn, your tools and equipment all require a reliable, weatherproof garden sheds to be stored in. But, what is the best type of garden shed in the UK to buy? Gardening is one of the most satisfying outdoor hobbies. Whether you grow your own veg or venture into the garden just to mow the lawn, your tools and equipment all require a reliable, weatherproof garden sheds to be stored in. This could be in either a wooden or metal sheds. But, what are the best type of garden shed in the UK to buy? We’ve rounded up our most popular garden sheds and categorised them into different types, so you can easily find one that suits your garden. A plastic, metal and wooden shed all have their benefits and flaws and suit some gardens more than others. Compare each shed type in our pros and cons section and discover what type of shed can benefit your garden most. 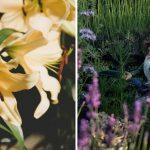 There are pros and cons to every type of shed so it’s important to way up what you need in order to find the right one for your garden. Here you will find the advantages and disadvantages of metal, plastic and wooden garden sheds. Metal sheds are renowned for being durable and strong, which is ideal if you want a secure shed to store your valuable tools. They’re also hardwearing against the elements and won’t suffer from rot, offering long-lasting garden storage all year round. Arguably the most popular the garden shed, wooden sheds come in modern or traditional designs to suit most gardens and can be easily modified to add shelving or more storage. Wooden sheds are generally much easier to work with and assemble. Depending on how thick the timber, you can opt for domestic or heavy duty use. The cons to wooden sheds are that they require regular treatment at least once every couple of years which can be costly. If not treated, wooden sheds can become susceptible to the elements so it’s important to keep them maintained. You can also opt for pressure treated options on some sheds, which means they don’t require treatment at home. Plastic sheds are the most affordable storage option and offer durability and weather resistance. Higher-end plastic sheds can cost more are longer-lasting and require no maintenance. They also avoid issues such as rot or rust and are easy to assemble. The main disadvantage to a plastic shed over wooden and metal sheds is that they are not as secure and can be affected by extreme temperatures. Customising plastic sheds can also be more tricky than with the other types. The garden sheds all offer the perfect space to store your tools, gardening equipment, and garden furniture. Once you’ve decided which type of shed is best suited for your garden needs, you can take a look at each shed in more detail. Take a closer look at our most popular sheds in detail below. The BillyOh Partner Apex Metal Shed is a popular choice due to its durability and reliable design. The shed offers simple, easy storage for any garden and requires no treatment at home. If you’re looking for a low maintenance building which will keep your gardening tools and equipment safely secure, the Partner Apex is an ideal choice. The traditional apex roof and green exterior complement most gardens. You’ll also receive a steel foundation kit as standard. If you’re looking for compact garden storage for your modern garden, the BillyOh Combo Pent Metal Shed comes up trumps. Constructed with a galvanised steel coating, the shed offers great weather protection and is easy to assemble. 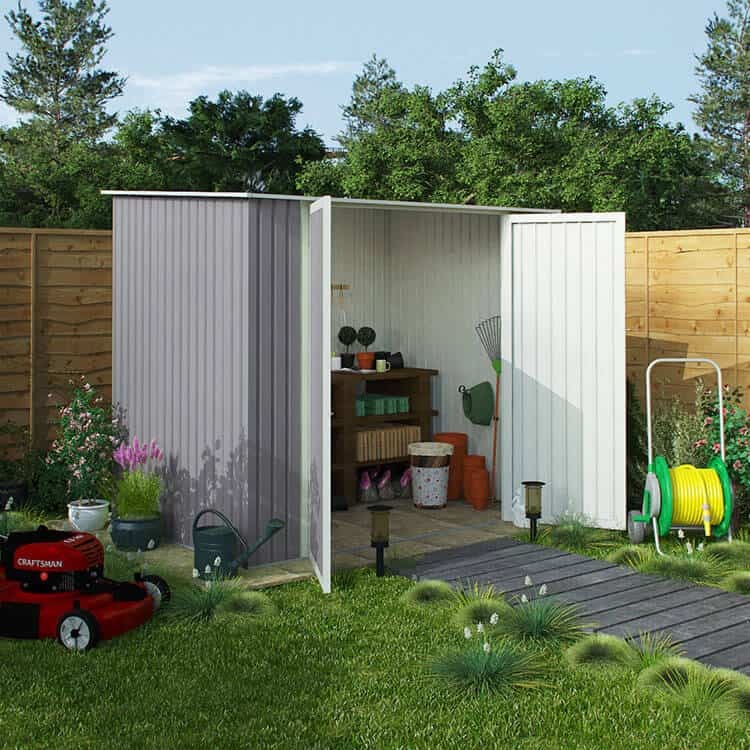 A compact size means the metal shed is perfect for smaller gardens. 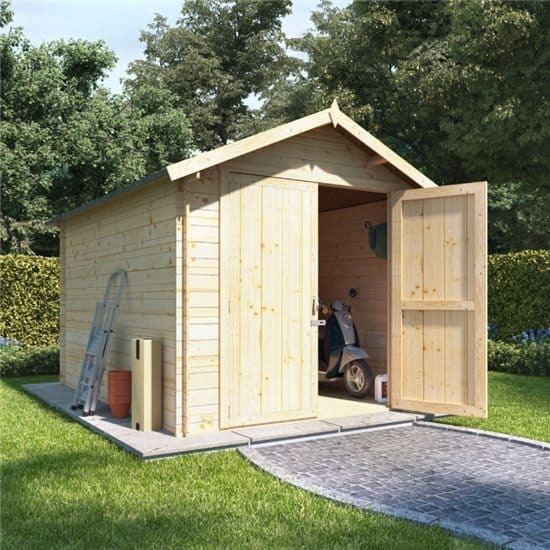 This wooden shed has a traditional, apex design which complements the look of any garden. If you want a reliable, cheap shed for garden storage, the BillyOh Master Tongue and Groove Apex Shed could be a perfect choice. The T&G double doors allow easy access in and out of the shed and make it simple to manoeuvre large or bulky items. The Pent Shiplap Central Double Door Wooden Shed combines a modern design with a reliable construction. The T&G shiplap offers good durability for the building, and mineral felt offers great weather protection. Central double doors allow you to access the shed easily and you can upgrade the floor to various thicknesses for domestic to heavy-duty use. Windows provide good natural light when spending time in the shed. This BillyOh StoreMax is a reliable plastic shed for any garden. The classic design means it will complement most gardens and the long-lasting vinyl cladding adds complete weather protection for your garden storage. The wide double doors make accessing your tools easy. If you’re looking for a garden shed which will look after itself for years and years, the StoreMax is a great choice. 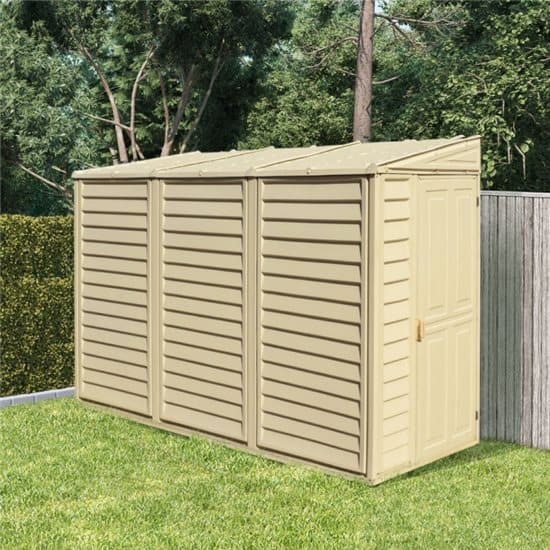 If you don’t want to take up space in your garden with a shed but need garden storage, the BillyOh Retford Premium Woodgrain Pent Plastic Shed is a great alternative. Simply add the side of your house or a fence and you will have a place to add tools and gardening equipment all year round. 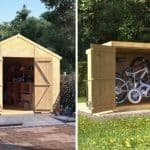 If you’re looking for a heavy duty shed to store your valuable gardening tools and equipment, this shed is a great choice. The 19mm interlocking boards give the shed great weather protection and a windowless design provides security for the building, keeping items out of site. 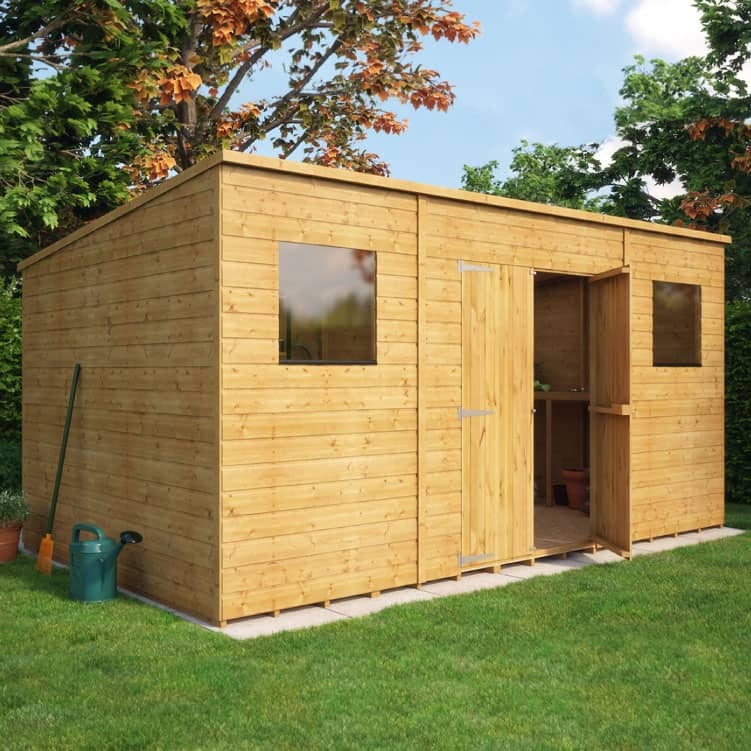 The BillyOh Apex Log Cabin Windowless Heavy Duty Shed is available in a range of sizes to suit all gardens. This shed is a more modern alternative to the Apex version above. The 19mm interlocking boards provide you with a weather-resistant shed that is long-lasting. A windowless design provides security for the building, keeping items safely out of site. The BillyOh Pent Log Cabin Windowless Heavy Duty Shed comes in varied sizes to suit most gardens. 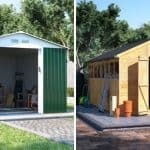 Every type of shed has something different to offer, so it’s important to compare them in order to find the right one for you before you buy garden shed. These are just some of the wide range of sheds we sell, so check our website for more high-quality garden sheds. Looking for some more shed information? Why not take a read of our Find out more about our advanced guide to sheds, our reviews, and our customer stories?